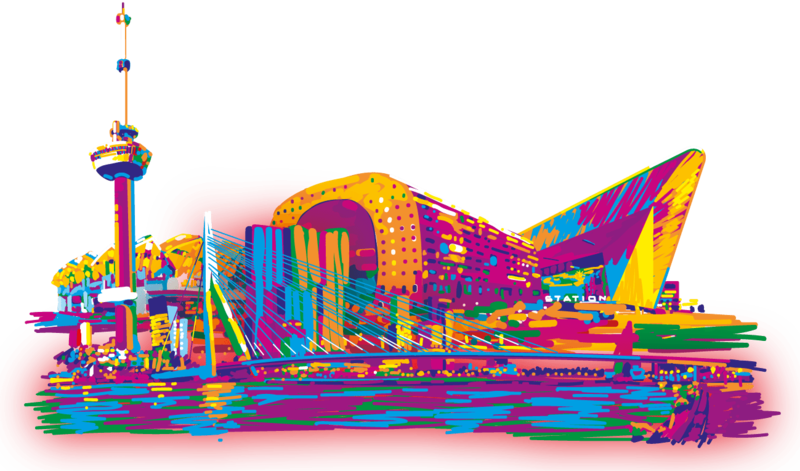 Visiting Rotterdam soon? Good idea: of course when you visit Rotterdam you have to do a sightseeing tour. Spot the highlights of Rotterdam with Sightseeing Rotterdam. Sightseeing Rotterdam is a sightseeing tour in a convertible bus as you often see in big cities like Paris, Barcelona and London. Step in at Sightseeing Rotterdam and discover Rotterdam in style. With the cabrio bus driving you through the highlights and main places of interest in Rotterdam. Sightseeing Rotterdam is a 7-language audio guided sightseeing tour. With Sightseeing Rotterdam you see Rotterdam as the crow flies. The sightseeing tour is a tour of about one hour. After the tour you can make your own plan on the free map to further explore the city. Sightseeing Rotterdam takes you along the impressive Market Hall, The Cube Houses, the imposing new Central Station, the Euromast and much more. Make your hair flutter in the wind when you stroll through the city centre in the open-air bus. Rotterdam is the way to go. The ideal way to see Rotterdam. By car? then the navigation address what you can keep is parkhaven 20. When you follow the signs Euromast visit the Park. Right for the Euromast Tower and the Park haven is a parking lot. Tramwith tram line 8, you can get off at the stop dijkzicht/Euromast. From this point it is a 5-minute walk from the Park haven. Sightseeing Rotterdam is one of the many attractions that Wielders Management has to offer. All attractions have one thing in common: water! Because we have an unique location, at the Maas. Because the water offers an awesome view of the skyline. Because sailing is relaxing. Because the Maas offers numerous adventurous and recreational possibilities. Because the Maas is the heart of Rotterdam. City Sightseeing Rotterdam was founded in 2015 and is a member of City Sightseeing Worldwide. City Sightseeing worldwide operates in more than 100 locations. The bright, cheerful and fun-filled red buses are sought after by tourists and visitors to some of the world’s top destinations.